1. Good behaviour is expected at all times. That is behaviour including language, that will not cause offence or embarrassment to any member of the general public, other swimmers, parents and coaches of COLSC, or any visiting, home or other swimming club. 2. Regardless of age or gender sharing of changing cubicles is not permitted in any circumstances. 3. At no time regardless of age or gender will swimmers be in the same changing cubicles together.Any breach of these rules will be dealt with under the club's disciplinary procedure. 5. Bullying, whether physical, verbal or emotional will not be tolerated by the club. 6. All swimmers are expected to follow instructions given by any coach or by any designated official or club official and to comply with these instructions immediately, without argument or question. 7. The use of any drugs or substances, other than for medical reasons, is prohibited. Swimmers are reminded to check that any drugs used for medical purposes are not on the current Swim England Banned List. 8. 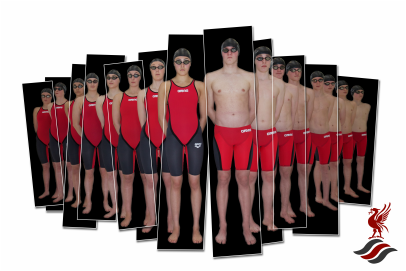 Swimmers should be recognisable as COLSC swimmers when representing the club and especially during team competitions, by wearing the team kit. 9. All swimmers are expected to be friendly and loyal to their team mates. Supporting and encouraging all COLSC swimmers in both team and individual events. 10. COSLC swimmers are expected to demonstrate a good attitude, set a good example and put every effort into their training and competition. 11. When using social media, swimmers should not post photographs or comments without the consent of others, or make such posts that could bring the club into disrepute. Swimmers should follow abide by the rules of the building/event when using mobile phones or other electronic recording devices. 12. Failure to adhere to the code of conduct will result in sanctions being applied by the club or quad. On the first occasion a council representative, team manager or other club official will speak to the person concerned and explain that their conduct is unacceptable and must stop. A record of this will be made for cross referencing purposes. A further instance will lead to the offence being reported to the Head Coach/council representative and or committee, who will issue a formal verbal warning and advise them that their conduct is now being viewed seriously. They may be asked to leave the pool. Any further repeats of unacceptable behaviour will result in a final written warning being sent to the swimmer’s parents, guardians or carers. Failure to improve may result in a suspension from the Liverpool City Council Swimming Training Scheme and City of Liverpool Swimming Club activities including all gala's that may have been entered for a period of time appropriate to the level of seriousness of the offence. During the suspension all fees will be payable and no refunds will be given unless stated in the meet conditions. Serious breaches of the code of conduct may lead to instant suspension; this will be at the discretion of the Head Coach, Appointed Council Officer and in conjunction with the Welfare Officer. This will remain in place until a disciplinary sub-committee can be set up if the offence was committed in or under the name of the City of Liverpool SC or appropriate members of the Council Head Coach, Coaching Staff and Management will meet and a decision made on the relevant action to be taken. A reintegration meeting will take place with appropriate authority and staff, namely City of Liverpool Swimming Club or Liverpool City Council Swimming Training Scheme, before the swimmer is allowed to return to training with the Liverpool City Council Training Scheme, or compete for the City of Liverpool Swimming Club. Following this, there will be an agreed period of monitored reintegration. Finally, if after a limited period of suspension the swimmers behaviour continues to be unacceptable, then the matter will be raised with the Liverpool City Council Head Coach & Management or the City of Liverpool SC Head Coach & Committee or appropriate selected committee members with a request that the swimmer be permanently excluded from the Council Swimming Training Scheme and or City of Liverpool Swimming Club or both authorities if deemed appropriate. A panel will be set up to deal with the matter in accordance with ASA complaints procedure and consisting of members of the appropriate organisation / authority but whom are not directly involved with the specific case. Within the panel, individuals concerned with the matter will be asked to attend a meeting, and if the person is under the age of 18 years, they can be accompanied by a parent, guardian or carer and will be asked to offer information and answer any questions that are appropriate to the offence. Following an investigation of the facts, a verbal decision will be given without delay, followed by a written confirmation of the final decision within 5 days.